I’ve decided to begin finally working toward my PhD. It is so time. I think a lot of the angst I’ve been feeling in my life in recent years has been because of not working toward this goal that I’ve been delaying for 15 years. Now, in my defense, part of that was by choice with my decision to have a kid when I did and to stay home with him and all that jazz. I mean, I had my reasons for waiting. But it’s been 15 years now. I’ve had my eye on that seminary since I was a student at Valpo. I’ve wanted to go to LSTC for over 15 years. I actually broke down and cried in the admissions office when I was talking with the Director of Admissions about my hopes and dreams for my PhD. “I’ve just always wanted to go here,” I balled. Oh, the tears. Oh, the longing of my heart. But I need a Master’s degree first…so I’m looking at my options on that and praying and talking with my spouse about how we’re going to figure this out. We’re going to have to reshuffle some things. I don’t know what will have to give, but I’m tired of the thing that gives being my dreams. I was so scared of coming home and talking about this. Like, I want to make this dream a reality, but I didn’t know if life and the universe and circumstances would let me. And y’all, I know my husband is a gentle man, a loving, supportive spouse, a man who celebrates me and wants me to shine, but I was scared of telling him about my sense of urgency for this. I was scared he would tell me no, not now. But, I tell you, David, my David continues to amaze me. I mean, freaking amaze me. He didn’t flinch. Not once. And I feel silly about this as I so often do when I realize that the main thing holding me back is my own self. I’m sorry, self. I will try to do better living authentic me-ness. I’m sorry David, I will try to trust you better. You told me when we married that you knew I would grow and change and you were ready for it–that you were all in and braced for it and excited to ride that ride with me and you have stayed true to that–so true. So, this PhD thing is getting in motion, friends. I’m going back to school. 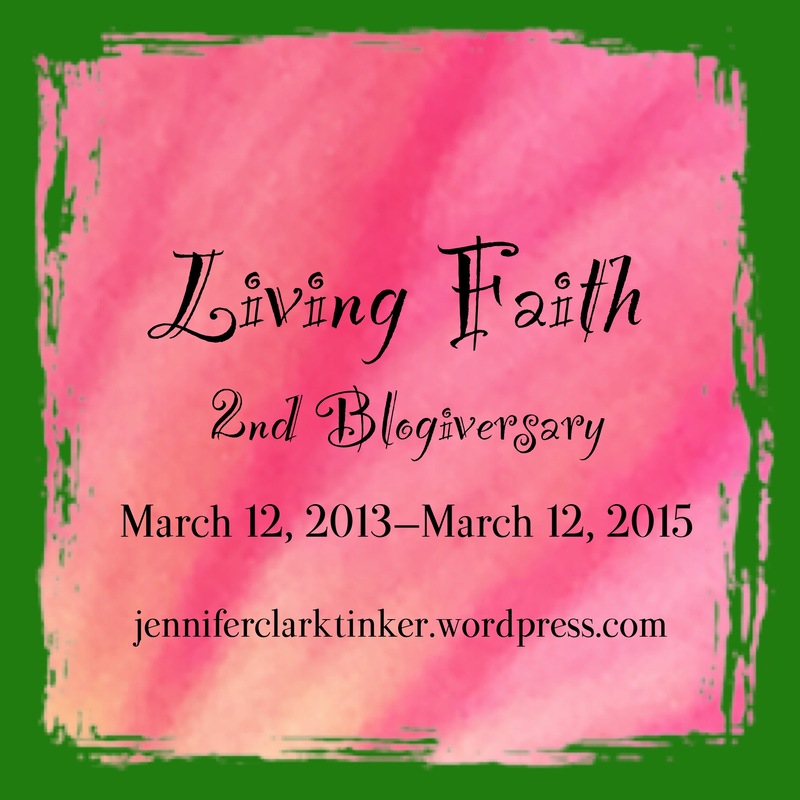 Today marks the completion of another full year of blogging; it is my second blogiversary! I’ve been at this for two whole years! It’s hard to believe that much time has gone by since I decided to take myself seriously as a writer. And a lot has happened over these two years. Like any 2-year-old, though, I think my blog is still deciding what it wants to be when it grows up. But being the 39-year-old that I am, I feel like I should have this figured out better by now. The truth is, the blog has played an important role in helping me get started as a writer. And that has been lovely–for me. What I have struggled with over these two years is figuring out what it is about this blog that is of value to y’all, my dear readers. I may be breaking some blogging taboo by sharing that concern here on the blog, but it is the elephant in the middle of the blogging room for me. So, I’m naming the elephant: I don’t know what I’m doing here. 1. What has/have been your favorite post/s so far? 2. What do you appreciate most about this site? 3. What do you wish there was more of here? 4. What else can you tell me about what this blog means to you? As always, thanks for journeying with me in this. 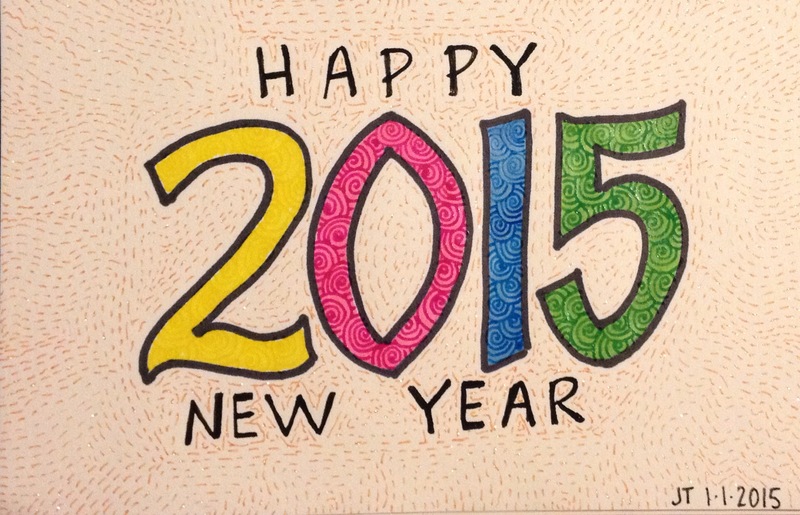 Well, it’s still January, so I hope it’s not too late to wish you a Happy New Year! I am not normally a New Year’s Resolution person. Last year I did a word for the year. My word was “present” and I came up with three resolutions to go along with that word. The truth is the word mattered more than the resolutions. I don’t even remember what all three of them were, just that there were three. The only one I remember is one I totally failed at. That’s pretty much been my experience with resolutions. 2015 was almost going to be the year where I decided not to bother with resolutions. And then my old buddy David Housholder posted something really lovely about the value of setting your intentions for the year. And when David Housholder is right, he is right. Then I sat around and felt guilty about not having a resolution. And I’m sure that’s not how it’s supposed to feel in a year where you deliberately choose not to have a resolution. So, once again I toyed with the idea of resolving not to make any resolutions this year. I mean, when you call it a resolution to not make a resolution, then you’ve got your bases covered, right? 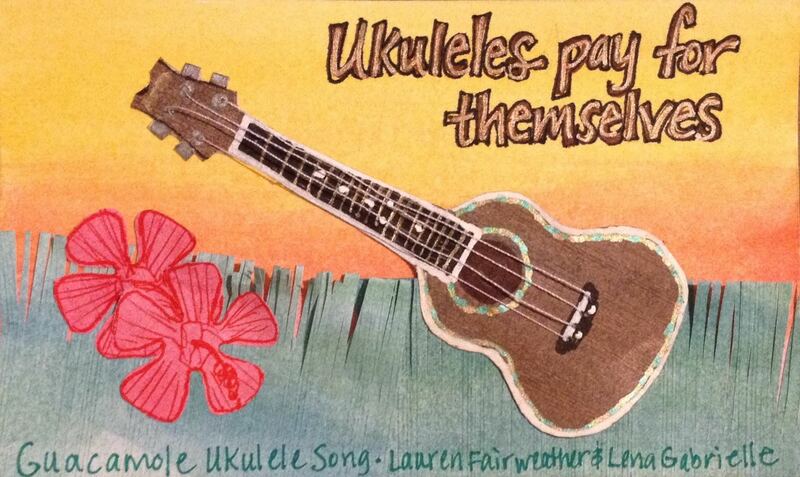 See, in addition to my writing and speaking, I’ve always been a bit artsy-crafty. I gravitate primarily to crochet and paper crafts–especially those involving gel pens. Over the past few years I’ve been working on cultivating my skills in doodling and hand-lettering. You may have noticed the art with my post titled Christmas Glow–the image of light shining in the darkness? Well, I doodled that. Since I have this job now as the interim minister at a nearby church, I am preaching every week. And I am using a lot of words writing sermons. So, not a lot of writing is getting done here or otherwise. But as I prepare for each sermon, after I do the majority of my study, I let the scriptures for the week bounce around in my subconscious for a while. Some words and images from the scriptures often pop into my conscious thoughts, and I have found it very meaningful–and fun–to create “scripture doodles” for them. Meanwhile, I joined a spiritual reflection group that encourages “art journaling” as part of the process. And I got a new book, “The Art of Whimsical Lettering,” by Joanne Sharpe, for my birthday. Soooo…I’ve been doodling and lettering like crazy. And I’m loving it. And I’m finding that the more I create, the more creative I feel. It centers and relaxes me, and it also refreshes and energizes me. It’s really quite wonderful. It actually got to the point that I was a little worried that I might have been spending too much time with my doodling. But every time I mention it to my husband, he encourages me exuberantly–I think partly because he knows how much joy it gives me and also because he seems to enjoy what I create with it. If it helps my creativity, gives me joy, and delights others, then I think these doodling “jenanigans” are worth pursuing. My son is most insightful, my doodling is more than just “doodling”! Doodle more often and call it art. A few weeks ago I made the disappointing discovery that I had lost my Deaconess pin (again). And I shared that story here on the blog. I wrote about how I was getting down on myself about losing something so important, but then it occurred to me that I lost it because I was wearing it a lot. And I was wearing it a lot as I cared for my mother-in-law, Elaine, in the time leading up to her death. And I was wearing it a lot as I worked in Elaine’s kitchen, cooking for the family in the days surrounding Elaine’s death. So I came to terms with having lost it because those were good, important times to be involved in serving and such. And I really had let go of the need to berate myself for losing my pin. But the fact still remained that I did not have my Deaconess pin. And that was still an issue for me, because it still is an important signifier of my ministry. And then I started this new job as the interim minister of a church near where I live. And I really felt odd not having my Deaconess pin on at this new gig. This is the first ongoing job I’ve had in a very long time, and I preach there every Sunday and they call me Deaconess there and everything. So, to not have my pin on was just not right. I had almost made up my mind that I was going to call up the Lutheran Deaconess Association (LDA) and order a new pin–if you’re counting, that would have been my fourth pin. But I still held out hope that I might find my pin somewhere. I kept checking and rechecking any place I might have left it. Even Wednesday night as I was packing my tote bags to come for Thanksgiving at my father-in-law’s house in Houston, I rechecked the side pockets of the bags. But the pin still wasn’t in those same crazy pockets I had checked a bazillion times before. And when I got to the guest room where we sleep at my father-in-law’s house, I looked once more on and around the desk and bed just in case I had missed the pin there before. But it still was not there. It wasn’t anywhere obvious. I didn’t give it a whole really lot of thought. And it was late, and I was tired, so I put it out of my mind and went to bed. By Thanksgiving morning, I had entirely forgotten about the pin. There was work to be done because I was the chief cook for Thanksgiving dinner for 24 people. And that alone is enough to think about. But this was at my in-law’s place…in Elaine’s kitchen…without Elaine. And I tried not to think too much about this being the first Thanksgiving without Elaine. Because there was work to be done. So I was just focusing on what needed to be done. Turkey was roasting and other prep was underway. I was in the zone. I had chopped up all the celery and onions for the dressing, and I needed to get a pan to sauté them in. I knew exactly which one I wanted–the giant, enameled, cast-iron skillet. Of all of the utensils in Elaine’s kitchen, this one is by far my favorite. It’s a heavy pan, and it’s a bit hard to get to as it is nested under a stack of other heavy pans, each layer carefully separated by protective layers of paper toweling. I could explain to you the intricacies of how everything is stored in Elaine’s kitchen, but the main thing you need to know is that it is really a pain to get this pan out of there. But it is my precious as pans go, so I am always willing to do the acrobatics needed to get it out. And as I made the final contortions to pull the prized pan out of its place and prepared to remove the paper towels from inside it…there, on top of the paper towels, inside my favorite pan was my Deaconess pin. There’s my Deaconess pin–right where I left it apparently–inside my favorite pan in Elaine’s kitchen! It made total sense that it was there. Because that is my favorite pan. And I was the last one to have used it. And I was the one who put it away–partly because I was the one who got it out, but mostly because it’s even harder to put away than it is to get out. It must’ve fallen off while I was putting the pan away, landing so softly on those paper towels that I didn’t even realize it had fallen there. 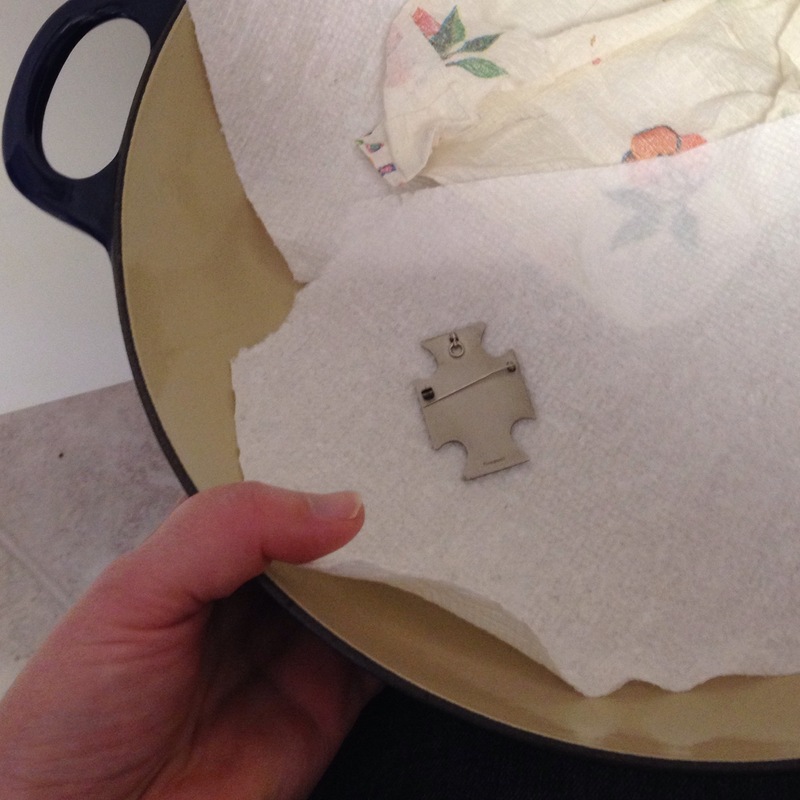 Finding it then–on the first Thanksgiving without Elaine, and there–inside my favorite pan in Elaine’s kitchen, finding it like that was the perfect encouragement. And I wept. And then I put my pin on and cooked. It’s not like the pin gives me super powers, but symbols do have meaning. And that pin helps me remember who I am, whose I am, and what I’m about. I know those things even without the pin, but sometimes when life and ministry and kitchens get overwhelming, I forget to remember. But there is so much work to be done in life and ministry and kitchens that I want to be sure to remember my identity as a servant, my belonging to a gracious God, and my purpose to share love and hope and joy in all I do and say. Now, I don’t have to call the LDA and order a fourth pin after all! And I can wear it the very next time I preach! And each time I look at it, I will always think of Elaine. And I will have this story to tell about the surprise of finding my Deaconess pin inside that favored pan on Thanksgiving 2014.